"When I was sick with cancer, we sold our car to pay for the surgery. We sold our TV, we sold our refrigerator, jewelry, everything we could. Now my wife Lydia has cancer and there's nothing left to sell." -- Viktor Gaidak, Chernobyl engineer for 24 years. Viktor Gaidak shows his scar after surgery for colon cancer. Like the Gaidaks, nearly half the 49,360 evacuees from Pripyat live in Troeshchina, a new neighborhood at the edge of Kyiv, Ukraine, where they face health problems, unemployment, crowded apartments and insufficient government support. Photo title: Viktor Gaidak shows his scar. Caption: Viktor and Lydia Gaidak sit in their apartment in Desnyanskiy district at the outskirts of Kyiv. Viktor Gaidak worked for 24 years as an engineer at the Chernobyl plant, including 9 years after the 1986 accident. 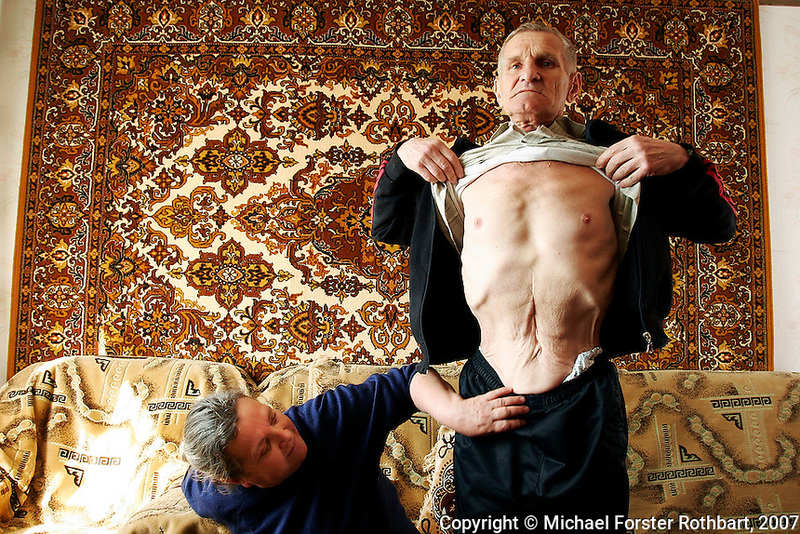 In 2004 he had surgery for colon cancer...Today, nearly half the 49,360 evacuees from Pripyat live in Troeshchina, a new neighborhood at the edge of Kyiv, where they face health problems, unemployment, crowded apartments and insufficient government support. Quote: . "When I was sick with cancer, we sold our car to pay for the surgery. We sold our TV, we sold our refrigerator, jewelry, everything we could. Now my wife Lydia has cancer and there's nothing left to sell. ".-- Viktor Gaidak, Chernobyl engineer.